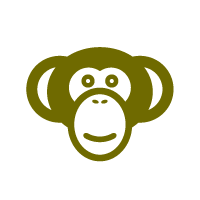 The monkey is a symbol meaning fun, activity, charm and an energetic nature. It is one of the signs of the Chinese zodiac which shows a person who has many friends. It is a sign of natural curiosity, but can show self-indulgence and rebellion. The monkey is loyal, witty, playful and intelligent and the character has made it be adopted into religion, folklore, myth and astrology. As a tattoo symbol, Chinese kanji is depicted to leap over various parts of the anatomy while the Chinese zodiac is super-quick and multi-talented and opportunistic. In Hindu, it is a god called the Hanuman who is believed to be the reincarnation of Shiva their god. The monkey god is heroic and dedicated to justice while in Japan the monkey was the messenger of the gods. It was seen as a symbol of a harmonious marriage, safe childbirth, fertility and a protector against disease and demons. A famous folklore tells of the monkey who accompanied a monk who carried the holy Buddhist teachings, on his journey from India to China. The monkey was chosen because it was smart and courageous and could protect the monk from demons and evil spirits. In Mexico, the Mayans glorified the monkey as a patron of the arts and was a symbol of knowledge and prophecy and it was also associated with the sun by the ancient Aztecs.